Halfway up the 85m tower of the New Townhall is one of Munich biggest tourist draws, a two-tier Glockenspiel (Carillon) with 43 bells and 32 mechanical figures. The figures rotate around accompanied by music of the bells. Duration ca.15 minutes. The group of figures in the upper part re-enact a tournament held during the wedding of Duke Wilhelm V and Renata of Lorraine, which took place here in 1568 along with lavish festivities. The knights on horseback represent Bavaria (in white and blue) and Lothringen (in red and white). The Bavarian knight wins every time of course. Below this the historical Schäfflertanz (Coopers' Dance or Barrelmakers' Dance) which was performed in 1517 at the end of a terrible plague to encourage the citizens to come out of their houses. The dance takes place also every seven years embodied by members of the coopers' guild on several places in Munich. The next one is in 2019. Finally a small golden rooster at the top of the Glockenspiel chirps three times with flapping wings marking the end of the performance. Munich’s Glockenspiel is the largest in Germany and the 4th largest in Europe. Daily at 11am, noon and in summer also at 5pm. Every day in the evening at 9pm you can watch the performance "Bedtime for the Münchner Kindl". 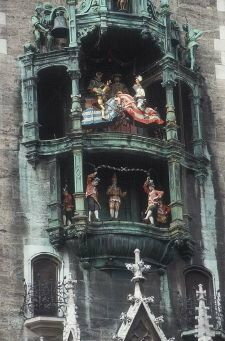 A night-watchman appears in the left pillar arch and blows his horn three times whereupon an angel in the right pillar arch begins to move and stretch a protecting hand over the Münchener Kindl, a child-like monk, who is Munich's heraldic figure and mascot. This performance lasts only five minutes.